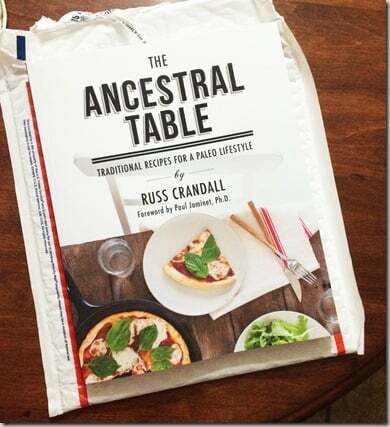 Earlier last week, I was commenting back and forth with Russ Crandall, the Domestic Man, on Instagram about favorite dishes I miss since having to cut gluten and choosing to eat the Paleo way. I mentioned a couple of favorites like chicken fried steak and GRAVY and sesame chicken. The next morning, Stephen walked in with the mail from the day before that he picked up on his way to night shift. It’s a good thing he no longer panics at my girl screams and squeals. He didn’t bat an eye as he was making coffee. “I take it that’s a good package?” he said. And yes, it definitely was. I have been watching (stalking) this man for weeks. He has been sharing cookbook teasers, recipes, and pictures to get us all clamoring for this book and it has been working! I skimmed through, marking the CHICKEN FRIED STEAK that we had just been commenting about and about a dozen other recipes I tagged at first glance. I already had a list of things to make for my weekly prep meals and I found the perfect recipe to add to it. Sukuma Wiki. 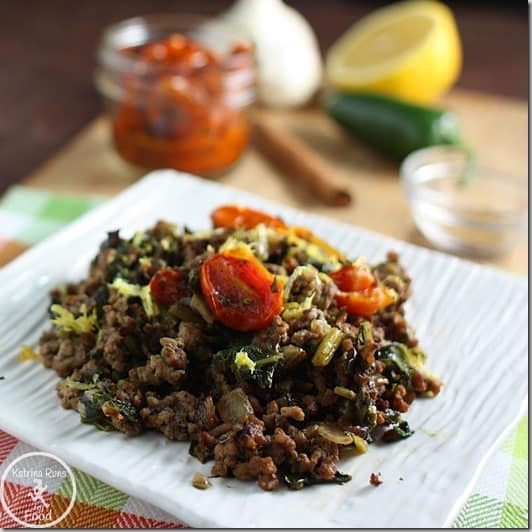 This is a flavorful dish of ground meat and collard greens that has its origin in Kenyan roots. It is something completely different but has a robust flavor that is more than just beef and greens. I used my own roasted cherry tomatoes from last summer and used some lemon zest to deepen that flavor. This recipe was fantastic! Easy ingredients, quick prep, and a big pan of flavor when it was finished. Because I’m in the middle of Whole30, this recipe follows the guidelines and helped break that chicken-and-sweet-potatoes rut that I’ve been in. Enjoy this first recipe and look for a full review of the Ancestral Table in the next couple of weeks! You can always go ahead and pre-order on Amazon. Warm olive oil in a skillet on medium heat. Add onion.Sauté about 5 minutes until softened. Add garlic and jalapeño and sauté about 1 minute. Add beef and spices. Cook until just done, stirring frequently. Add collard greens and tomatoes and cook about 5 minutes, carefully tossing throughout cooking. Serve, top with lemon zest.